Frankfurt Card is Worth Buying? With a lot to offer to its visitors, Frankfurt is a very popular tourist destination. The city features many noteworthy attractions and guided tours that allow you to admire its beauty and get to know its history. In addition to the city's attractions, you can benefit of the UNESCO-declared sites and castles a short ride away from Frankfurt. To help you get the best value for money, we have elaborated top points of interest and compared available tourist passes for you. Frankfurt Card allows you to achieve savings for visiting the city's attractions. RheinMainCard does the same for touring the wider area around the city, in general. Thus, choose the pass that suits your needs best (links are available in the table) and have a great time. Frankfurt Card allows you to benefit of big savings while visiting attractions of Frankfurt. Free use of the city's public transport is included in the price. The RheinMainCard allows you to pay less for visiting attractions in the neighboring area of Frankfurt. You can use the regional public transportation system without charge. With the Frankfurt Card you can save a substantial amount of money through discounts while visiting tourist points of interest. The card also provides discounts in the city's shops, restaurants and theatres. Also, you benefit of free use of the public transport. The RheinMainCard allows you to achieve significant savings while visiting the participating establishments. In addition, you are allowed to travel for free within the limits of the RMV area of operations. Write down a day of issue and your name and present the card while entering participating attractions. Present your card at the entrance of the participating attraction. The card is valid from the date of issue. You can order the card online and print it. You can purchase the pass at Frankfurt Airport's welcome center, information center at the Main Train Station and some other tourist centers in the city. The card can't be cancelled. Where to Buy Frankfurt Card? We are comparing the Frankfurt City Passes Prices from leading online Tours and Ticket suppliers Tiqets, Viator, GetYourGuide & TicketBar, try to find you cheap tickets prices on the market. Where to Buy Rhein Main Card? The Frankfurt Card offers the best experience to tourists who wish to see the beauty of one of Germany's most adorable cities and its financial hub. Explore Frankfurt and see the headquarters of the European Central Bank and many other top attractions. With the 1or 2-day Frankfurt Card, tourists enjoy free public transportation to and from Frankfurt airport, discounts and special offers at restaurants, attractions, tours, museums and many more. Tourists can choose between a single person card (individual card) or the group card which gives a group of 2-5 persons' access to all the benefits that come with the Frankfurt Card. See sights and attractions such as the Titus Thermen pools, Palmengarten (Botanical Gardens) and explore the city onboard the Main River cruises while saving money and enjoying your time. Explore Frankfurt with free public transportation (bus, tram, underground, suburban trains including to Frankfurt airport). Embark on sightseeing tours, restaurants, museums, shopping, and many more. Choose between a 1 or 2-day card for a single person or groups of (2 to 5) persons. The card is valid within Frankfurt's city districts and the Frankfurt International Airport. Enjoy a mouthwatering 50% discount at various Frankfurt attractions such as Alte Oper (Old Opera), Oper Frankfurt (Frankfurt Opera), Schauspiel, The English Theatre and Papageno Musictheater at Palmengarten, Frankfurt Zoo, Schauspiel Frankfurt (Playhouse Frankfurt), restaurants and shopping..
Marvel at sights such as the Palmengarten (Botanical Gardens), the main tower, Rebstockbad, Brentanobad (water parks), Indoor Go-Kart Circuit, and Titus Therme. See Frankfurt through public city walks, motorized city tours, river cruises and more. Enjoy walking tours and Main River sightseeing cruises with a 1 or 2-day Frankfurt Card. Tourists will enjoy free public walking tours to explore Germany's financial city and home to the European Central Bank. With the Frankfurt Card, tourists get to enjoy up to 50% discounts on admission into top attractions, cruises, tours and many more. Where to buy Frankfurt Card tickets? How much is The Frankfurt Card? We are comparing the Frankfurt City Passes Prices from leading online Tours and Ticket suppliers. 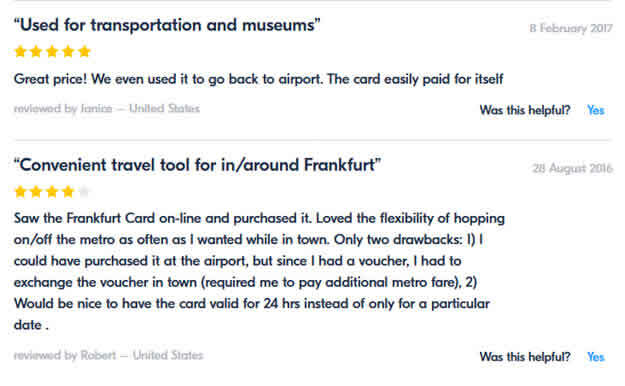 The total number of tourists that reserved the Frankfurt Card through this booking website, rated their experience with 4.4 (89 reviewers) rate. "great price" and also "used it to go to the airport". Another reviewer by the name Robert stated that he "saw the Frankfurt Card online and purchased it". The Frankfurt Card is fully packed with discounts, special offers on tours, walks, shopping, experiences and many more. With just a 1 or 2-day 1 person (single card) or group (2-5) Frankfurt Card, tourists get to enjoy value for their money and up to 50% discounts during their stay in Germany's financial capital city. Some of the highlights that comes with this card is the pleasure of seeing sights such as the European Central Bank, Alte Oper (Old Opera), Oper Frankfurt (Frankfurt Opera), Schauspiel, The English Theatre and Papageno Musictheater at Palmengarten, Frankfurt Zoo, Schauspiel Frankfurt (Playhouse Frankfurt), restaurants, shopping and more. This card also offers walking tours, bus tours, main river cruises to give tourists a memorable visit. Is the Frankfurt Card right for me? This Frankfurt Card is right for adults and children alike. By purchasing the single entry card for 1 person or the Frankfurt card for a group (2-5 persons) to enjoy the benefits to see sights, attractions in this financial capital city which houses the European Central Bank, museums, Alte Oper (Old Opera), Oper Frankfurt (Frankfurt Opera), Schauspiel, The English Theatre and Papageno Musictheater at Palmengarten, Frankfurt Zoo, Schauspiel Frankfurt (Playhouse Frankfurt), and more. Enjoy up to 50% discounts and relax at restaurants and shop for your family and friends at your leisure. Discover the amazingness of the regions around Frankfurt and its diversity with the RheinMain Card. This card offers discounts at cultural establishments and over 40 recreational sights, and attractions. Tourists get to enjoy unlimited access to RheinMain Transport Association (RMV) all through the areas it operates in. Visit museums, take a guided tour of the Opel factory or relax in the sauna to ease off with your 2-day RheinMain Card. The Rhein-Main Card can be bought as an individual ticket (single) or a group ticket (for up to 5 persons) regardless of age. 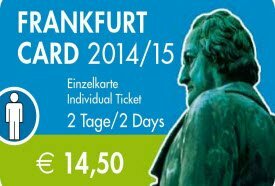 Choose between the RheinMainCard individual ticket or group ticket (up to 5 persons). Children under the age of 6 travel for free when in the company of an adult. The Rhein-Main Card is valid for 2 consecutive days with the due date printed on the tickets. Enjoy free and unlimited travel through the entire RMV area of operations. Reach Aschaffenburg and Bingen situated outside the RMV's fare zones easily onboard a cruise ship. Enjoy discounts on attractions, sightseeing tours and more. Enjoy special opening hours on public holidays. Experience a guided tour of the Opel factory, introductory golf lessons and many more. Explore Frankfurt at your leisure and pace. here are complimentary walking and guided tours included in the Rhein-Main Card. 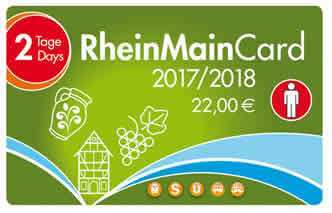 With the RheinMain Card, you get special discounts and offers on admission into attractions, tours, cruises and more. How Much is a 1/2/3 Day RheinMain Card? Note: Children under 6 years travel for free when accompanied by an adult. We are comparing the Rhein Main Card Prices from leading online Tours and Ticket suppliers. Departure Point: The Tourist Information Office Main Train Station (Hauptbahnhof) and Tourist Information Office Römer are the departure points where tourists meet. Tours and Top Attractions: Aschaffenburg (Aschaffenburg is situated outside of the RMV´s fare zones), Bad Homburg, Bingen am Rhein (Bingen is situated outside of the RMV´s fare zones), the City of Offenbach, County District of Limburg-Weilburg, Darmstadt, District of Offenbach, Forest of Odes, Frankfurt am Main, Fulda, Hanau, Hochtaunus District, Main-Taunus District, Mainz, Marburg, Rheingau-Taunus District, Rüdesheim am Rhein, Rüsselsheim am Main, Spessart, Vulkanregion Vogelsberg, Wetterau District, and Wiesbaden. The Rhein-Main Card is a 2-day card which gives tourists the pleasure to explore Frankfurt in a grand style. Explore and marvel at the wonderful and amazing regions around Frankfurt to see its diverse people. The Rhein-Main Card also offers discounts at cultural establishments including over 40 recreational sights and attractions in and around the city. 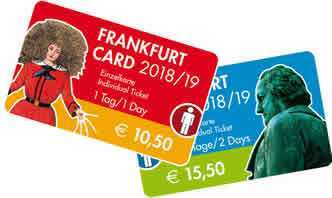 With this card, tourists get to enjoy unlimited travel around Frankfurt using the RheinMain Transport Association (RMV) throughout its area of operation. Tourists will visit museums, top attractions, see the financial capital and the European Central Bank headquarters, take guided tours of the Opel factory or relax in the sauna to ease off the day's stress. Other attractions include the District of Offenbach, City of Offenbach, Darmstadt, County District of Limburg-Weilburg and many more. Enjoy all these benefits with just an individual ticket (single) or a group ticket (for up to 5 persons) RheinMain Card irrespective of age. Is The Rhein-Main Card Right for Me? The Rhein-Main Card is perfectly right for both adults and children, co-workers, family and friends alike, who wish to see more of Germany's financial city. This card comes with great benefits such as discounts of up to 50%, visit museums, top attractions, monuments, sightseeing adventures, guided walking tours, and many more. The Rhein-Main Card is a 2-day tour pass which gives tourists the edge to see and learn as well as relax themselves in restaurants and saunas. The discounts cover over 40 recreational sights, cultural establishments, and top attractions. You get to enjoy free unlimited ride using the RheinMain Transport Association (RMV) to see sights and tour the regions in and around Frankfurt. As a tourist, you get to see sights and beautiful places such as the European Central Bank headquarters, City of Offenbach, County District of Limburg-Weilburg, Darmstadt, District of Offenbach, Aschaffenburg and Bingen am Rhein located outside the RheinMain Transport Association's zones which means you will need to get extra bus tickets for those. You will also enjoy guided tours of the city for a more in-depth tour of Frankfurt, the saunas in the city make a perfect place to relax and ease off the stress of your tour in Frankfurt. This is a sure way to enjoy Frankfurt saving money and enjoying your time as well. 1. Benefits: The ESN Card gives you a reduced entrance fee on various over-the-top parties (Docrock party-Entrance fee 4€ (instead of 6€) and access to the VIP Lounge;We are together-50% discount on entrance), along with a 30% discount on Grill Hause, a famous restaurant in Frankfurt. 2. 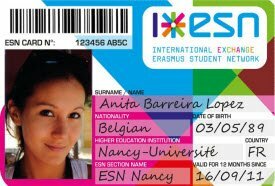 Cost and validity of card: The ESN card can be bought for 5 euros, if you are an international student. It is valid for a total of twelve months, giving you plenty of time to decide and look around. 1. Benefits: An ultimate chance to explore Frankfurt city with hop on and hop off blue busses tickets. These buses have specific 14 stops and runs after every 30 minutes from the start point. It covers am any historical and amazing spots around the Frankfurt city. One can stop over at their stops and enjoy the places nearby till they intend to catch the next blue bus. It's a complete package for tourists covering from the former coronation city of German Emperors, the modern European Banking Center, famous old city hall, the Cathedral, and St. Paul's Church, the Old Opera and the banking quarter with its skyscrapers, the old Hauptwache and shopping center Zeil, the big towers of the former city wall to the museum banks and many more. Those who love exploring new places will economically enjoy the whole city for whole day long validity. 3. Price & Validity: Available throughout the year -Price per adult $21.29 and Price per child $11.36. It is valid for one day only. 4. Online purchase: It can be purchased online. 1. 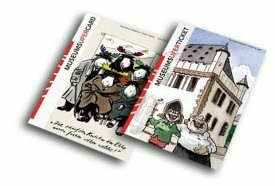 Benefits: Tourists can explore more than 34 different museums around Frankfurt at discounted rates using this card created especially for museum sightseeing. The Museumsufer ticket can also be used for all exhibitions taking place in the city. 2. Attractions valid: The Museumsufer ticket is valid for museums including Altana Kulturstiftung in Sinclair-Haus, Deutsches Filmmusuem, Porzellan Musuem, Kindermuseum, Frankfurter Goethe-Haus, Museum Giersch, Weltkulturen Museum, Archeological Museum Frankfurt, Caricatura Museum Frankfurt, Stadel Museum, Ikonen Museum and Frankfurter Kunstverein among many others. 3. Price and validity: The individual ticket is available for 18 Euros, the family ticket (2 persons) plus kids under 18 years of age can be purchased for 28 Euros. A special concessionary ticket is available for 10 Euros. Discounts on the card can be availed for children 6-18 years of age, students, unemployed individuals, people involved in social services and disabled individuals. The validity is 24-48 hours as per the requirements of the tourist. 4. Benefits of purchasing online: The ticket can be booked online to avoid delays and time wastage. 1. 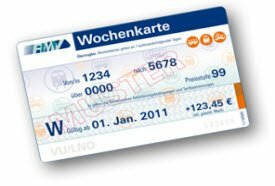 Benefits: The RMV-Wochenkarte e-ticket can help you save money as you start using it. With RMV card you can travel as much as you can on low prices and you can accompany one person free in evening and on weekends. It can be transferable too what more could one ask for? It is so economical that you can't resist without buying it and enjoying for whole one week. Using this card you can travel first class level travelling around the city Frankfurt. You may also be given chance to travel for free after 19.00 hr accompanied or either with all your children (aged 6-14years) on any day. 2. Transportation applicable: For all RMV modes of transportation like train, tram, bus, underground and S-Bahn services. 3. Price & Validity: Prices are available on site upon mentioning areas to travel. It is valid for a week until close of operations. 4. Online purchase: Available upon mentioning destinations to be covered.